This well-thought-out training regimen begins with an in-depth look at the necessary tools of the trade, including your scanner, software, and platform, and then moves to practical advice on subjects such as how to find the right stocks to trade, how to define support and resistance levels, and how to best manage your trades in the stress of the moment. An extensive review of proven trading strategies follows, all amply illustrated with real examples from recent trades. Risk management is addressed, including tips on how to determine proper entry, profit targets, and stop losses. Lastly, to bring it all together, there’s a “behind the scenes” look at the author’s thought process as he walks you through a number of trades. 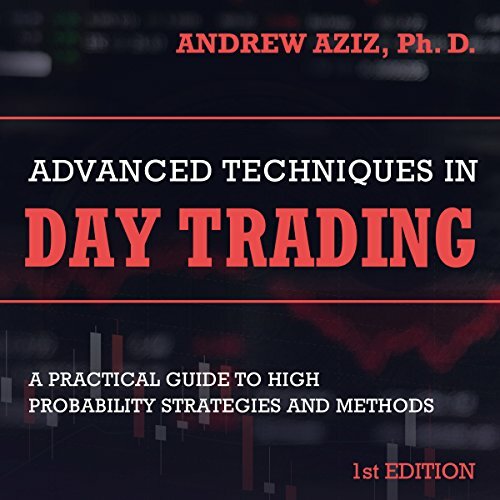 While aimed at the listener with some exposure to day trading, the novice trader will also find plenty of useful information, easily explained, within the audiobook. best of the best. chapters 6 7 8 are the best. Very usable book. I’ve been trading for a few years and enjoy seeing what other people have to say about Trading. This book is very practical and there are items that he practices but maybe some other traders wouldn’t do or vice versa. I 100% disagree with his assessment of Trend lines. It became apparent that he did not know how to use them correctly based on his examples. But there were so many other things that he was spot on in trading. Risk reward is the most important thing in Trading. So few recognize it and focus on it. Andrew is an amazing trader and teacher. If you're serious about day trading, then Andrew is who you need to be listening to. I can't imagine learning to day trade without him. Very informative and well written book! This is the second book I read from Andrew Aziz and I must say that his books are very well thought out and written. Packed with good resources, knowledge, strategy and examples of winning and losing trades. It focus on your psychology as well as money management skill set, the things we don’t typically think about, but that makes all the difference. You won’t regret reading or listening to this book or his other book: How to day trade for a living. Best of luck on your day trading career. The book goes over many strategies I use. His style is a little safe for my taste, however, for beginners these are essential and his methods do work. Just like any thing that makes you good money, you have to invest your own free time to truly become the best. The more time you put into learning day trading, the better you'll come out of the trenches. Day trading is NOT for the weak. I was surprised he didn't mention twitter or any other boards besides his and the incredible amount of information those platforms have. I also didn't hear him mention E*TRADE. My personal favorite platform because they offer many tickers places like Fidelity or TDA. Anyways, good advanced book for beginners, I was hoping for more juice as I have been doing this for awhile. Good book. Useful material. Well narrated and easy to comprehend. Recommend to anyone in the field beginner or advance. very informational and real. Listen to many many books on Audible and was able to gain some new knowledge and reinforced previously learned subject. well worth the listen. stage 3 out of 5 in tradeing. can make money now but end up giving it back working on keeping consistent profits. Purchased the Kindle a month ago and also the audio book recently to reinforce what Andrew is saying. This really helped me eliminate unnecessary thoughts, ideas snd perceptions that I've had about the stock markets. The combination of these teachings along with ideas and teachings of other traders (Boiler Room Trading & Learn Plan Profit) are helping me narrow down the world of trading and what type of trader I want to be. Thanks Andrew and looking forward to your next recap on YouTube!